Reference in the Biz journal about money for Cordish to begin the residential component of the P&L district. This has to be a misprint or I completely misunderstood the snipet. Exciting news. Anybody have access to the full article? Last edited by pash on Fri Feb 03, 2017 11:07 pm, edited 1 time in total. They're looking at the SE corner of 13th and Walnut, east of the Cosentino's. If asked, I think the city should carefully consider incentivizing housing. The right incentives would probably be a good idea. New housing might be more rightfully incentivized that any other need because the downtown vacancy rate is so low, and the apartments would probably fill up pretty quick. Rental housing is one of the bright spots in this economy. Downtown has not had any new large-scale housing built since Quality Hill (except the recent East Village Apartments and Market Station), and raising the population downtown is very important, and a goal of the City. Having more people living around P&L will help the retail there, and eventually help fill the empty spaces that remain. The sooner more people live downtown the sooner the City will quit having to make up the difference for P&L bond payments because permanent residents will need more retail services in the neighborhood than exist now. If this new apartment building is successful inside the Loop, developers will notice and be more willing to take a risk and build more new apartment buildings there. Cordish might also go ahead and built the other apartment towers along Truman between Grand and Baltimore that were in the original plan. The kicker is: without incentives, I'd guess normal construction costs would be around $100-$150 a foot. With incentives (prevailing wage, WBE/MBE etc. ), costs are closer to $200 a foot. How messed up is that? With interests rate as low as they are, it pays to take the incentive package. But what if rates were closer to the historical average 6-8%? There have been and continues to be housing built DT and it will likely increase without incentives. Organic growth is almost always better than manufactured growth. Be patient, grasshoppers. The article says there are plans for 350 apartments on that block between Main and Walnut and 12th and 13th. If I recall the plan called for a 35-story tower next to Cosentinos. A building of that height would be expensive to build I would imagine. FangKC wrote: The article says there are plans for 350 apartments on that block between Main and Walnut and 12th and 13th. If I recall the plan called for a 35-story tower next to Cosentinos. A building of that height would be expensive to build I would imagine. It almost boggles the mind to think of a 35-story building on that site, or a new residential high-rise in downtown period. Last edited by pash on Fri Feb 03, 2017 11:06 pm, edited 1 time in total. I need to correct myself. Web searches came up with several past references to the plan being for a 38-story building with 350 apartments on that block. For comparison, Town Pavilion is 38-stories, 909 Walnut is 35-stories, 1201 Walnut is 30-stories, and the old Power & Light Building is 34-stories. 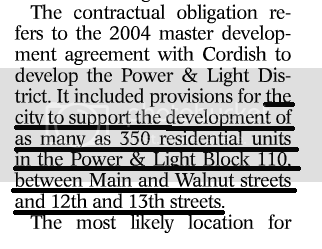 The Business Journal article actually says that the City is obligated to chip in for up to 350 apartments on block 110, which is the one between Main and Walnut and 12th and 13th streets. Here is a $100 million 33-story apartment building with 319 apartments being built in Philadelphia. Taxi, I also found a peer cities analysis from Denver of the Kansas City real estate market that claimed this for the downtown residential condo market: "Condominiums in Kansas City are averaging $350-$400 per square foot--22." Found on page 15 of the analysis. The footnote refers to a Downtown Council housing study from 2005. Last edited by pash on Fri Feb 03, 2017 11:05 pm, edited 1 time in total. Urban purists cringe but the reality is parking will always be important in this town (and will continue to be even if streetcar happens) and I don't see them doing a hirise building w/out a massive garage. I'd be OK with the City chipping in for the garage but only if it can also be used for free/cheap public parking like the other P&L garages. The City chipping in for infrastructure is OK to a point - a garage would be reasonable if partly public. Pash....is your comments based on any fact or just opinion? I'm not sure how large it will be but no reason to think they wont build around 350. Also that garage was built to hold vehicles for this building. Wasn't the garage also built to support a building on top of it? FangKC wrote: Taxi, I also found a peer cities analysis from Denver of the Kansas City real estate market that claimed this for the downtown residential condo market: "Condominiums in Kansas City are averaging $350-$400 per square foot--22." Found on page 15 of the analysis. The footnote refers to a Downtown Council housing study from 2005. Something does not seem right about that. Perhaps someone with more knowledge can chime in on this (loftguy?). At present, condos are selling for an average of $163 a sq. foot. So, even with incentives galore, I can't see this making any sense. There are examples of lofts selling for $350-400 prior to the peak. But, these were rare in KC. Most condos were sold in the $150-$270 range. Our condo market really did not have a long enough time frame to mature. Prioer to the market shift, developers routinely stated that , Downtown highrise condo construction would have to sell for $350 psf plus for a development to make sense. No need to discuss condo development yet. Rentals are the near term future. So Loftguy, use the rentals to pay off the loan for 15 years, and then switch to condos? Last edited by pash on Fri Feb 03, 2017 10:57 pm, edited 1 time in total.